As the name suggests, this range is bursting with colour and fun! This modern and exciting range is made in a mixture of designs, all of which feature some funky colour combinations, from bright blues and greens to vivid yellows and pinks, perfect for modern rooms or decors that require a lift in colour. 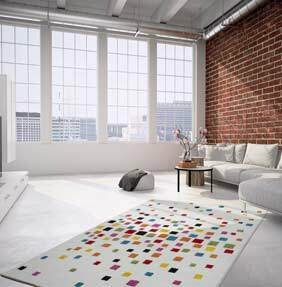 Due to the creative use of design and colour, Avanta Garde rugs will immediately become the focal point of any room. This rug is made from Max-brilliance yarn, this exciting yarn holds the bright dyes so well the colours virtually dazzle. The bold designs and bright colours in this range lend themselves very well to modern interiors, with the emphasis on statement making! With a wide variety of designs, this range is sure to have something to suit any modern space.